Last week I reported on an article by Caroline Glick, the associate editor of The Jerusalem Post. She postulated that since President Obama had lost control of the domestic economic agenda by losing control of the House of Representatives, he would turn his attention to the one thing he still controls almost absolutely: foreign policy. The Israelis fear that Mr. Obama will focus on forcing a peace settlement upon them. And since he's demonstrated his preference for the Muslim world, they fear it will be a "peace" that will be tantamount to national suicide for Israel. Ms. Glick also suggested that he'd begin his assault by putting pressure on Israel over the building of Jewish homes in Jerusalem. Not the settlements, but Jerusalem. Israeli Prime Minister Binyamin Netanyahu has expressed similar views since the election. From Jakarta, Indonesia, this week, the President made good on Ms. Glick's suggestion. He took a shot at Israel for building homes in Jerusalem. The President said, "This kind of activity is never helpful when it comes to peace negotiations." He said this from the world's largest Muslim nation. Prime Minister Netanyahu's office fired back with a statement reading, "Jerusalem is not a settlement; Jerusalem is the capital of the State of Israel." There is also concern that the Obama administration might attempt to pressure Israel by withholding its support when it comes to future resolutions condemning the Jewish state at the United Nations. Perhaps the US might tacitly back a Palestinian threat to unilaterally declare statehood at the UN Security Council. As you can see, the Israelis may be viewing the results of the mid-term elections with a perspective far different from ours! What's more, two recent polls in Israel confirm that the Israelis have more to be concerned about than just President Obama. The surveys reveal that while 78% of the Jews favor continuing the peace talks, an alarming portion of the Palestinians favor a return to armed violence against Israel. The Foreign Policy Research Institute has released a report in which it proposes that Hamas "is no longer a single, unified organization and should not be treated as such." Now, while that sounds promising at first glance, a closer look reveals that both of the factions still favor the ultimate destruction of Israel. They are, however, arguing over whether it should be achieved through renewed rocket and missile attacks or through the political apparatus. One of the Hamas leaders in Gaza, though, denied any disunity. He reminded supporters that the Jews "will soon be expelled from here." He urged Hamas and the Palestinian Authority to join forces. Mahmoud al Zahar said, "Together, with blood, we could liberate our lands and holy sites...." Hmmm. "Our lands and holy sites." He must have read the recent Vatican report of the Synod of Bishops for the Middle East! 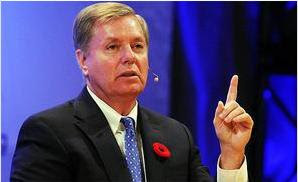 Lots of folks think that Republican Senator Lindsey Graham of South Carolina is a bit of a milquetoast. But at the recent Halifax International Security Forum, he made a few people sit up in shock. He offered some advice to President Obama about what he should do if the current sanctions fail to deter Iran's quest for nuclear weapons. Graham said, "Sink their navy, destroy their air force, and deliver a decisive blow to the Revolutionary Guards." On Sunday, in a private meeting in New Orleans with US Vice President Joe Biden, Israeli Prime Minister Netanyahu said something very similar. He noted that the only way to stop Iran's pursuit of weaponized nuclear materials is to "create a credible threat of military action against it...." He went on to wisely note, "Only a real military threat against Iran can prevent the need to activate a real military force." Oh, and just hours after Mr. Netanyahu expressed his views about Iran to Mr. Biden, Secretary of Defense Robert Gates, speaking in Australia, seemed to directly reject the Prime Minister's suggestion. He said, "I disagree that only a credible military threat can get Iran to take the actions that it needs to, to end its nuclear weapons program." Secretary Gates apparently feels that the "political-economic approach... is having an impact on Iran." I think Mr. Gates is an optimist. The President is currently in South Korea attending the G20 summit. He's apparently getting an earful about "QE2." No, not the famous luxury liner. "QE2" is shorthand for "Quantitative Easing, Round Two." That's the program the Federal Reserve Board announced the day after the mid-term elections in which the Fed intends to print up between $600 billion and $1 trillion to buy US Treasury bills over the next 6 months. In short, the Fed is going to create money out of nothing to buy our own debt that nobody else wants. You know, a little like you paying off your mortgage with your American Express card. Experts predict that this lunacy will further devalue the US dollar by as much as 20%. And we're not the only ones furious about this blatant Ponzi scheme. Russia, Germany, China, and other nations are fuming. So much so, that they had to take a time out from the discussions at the G20 to calm down. They see this as one of the most selfish stunts the Americans and, especially, the Federal Reserve have ever pulled. Undoubtedly, this will send into hyperdrive the push to "decouple" from the US dollar as the world's reserve currency. The Germans are especially angry. And with cause. They still remember the experience of the Weimar Republic. After World War One, the Germans tried to pay off their debts by simply printing more paper money. In 1914, 100,000 Marks meant a comfortable retirement. By 1919 - just five years later - it wouldn't buy a loaf of bread. It reminds me of the song Larry Norman recorded back in 1970. It was called, "I Wish We'd All Been Ready." It described the conditions that would occur in the days just before the Rapture and afterward. One line says, "Children died, the days grew cold, a piece of bread would buy a bag of gold. I wish we'd all been ready." Is that what we're facing soon? Folks, I believe the answer to that question is "Yes!" Even just a few short years ago, the prospect of the United States of America facing total financial collapse was laughable. Today, it's not only a possibility, it's a probability. In fact, John Allison IV, the former CEO of BB&T, the nation's tenth largest bank, says it is "a mathematical certainty." In fact, I believe it's possible that the current administration is trying to force this collapse so that our nation can be merged into a new global order. I've discussed that extensively on past programs. No matter what the reason, though, it's coming. And probably coming sooner rather than later. The time to get ready is NOW!